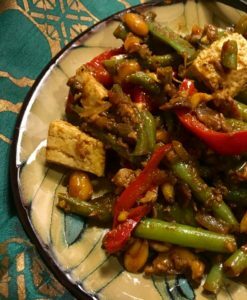 Ditch mediocre Chinese take-out and celebrate the power of soy in two ways—fermented black soybeans and tofu—in this simple summer stir fry filled with color, crunch, and umami goodness. Think soy can’t be part of a healthy diet? Think again. This protein and phytonutrient packed superfood is central to Japanese diets—and the Okinawans in particular are among the longest lived peoples in the world. Soybeans are such a fantastically versatile food with so many delectable uses that it was the focus of one of the cooking demos I attended at the recent Culinary Institute of America’s (CIA) annual Menus of Change conference in June. 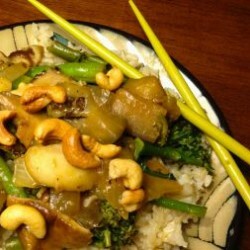 The session starred soy in plant-based recipes and, happily, included tastings. 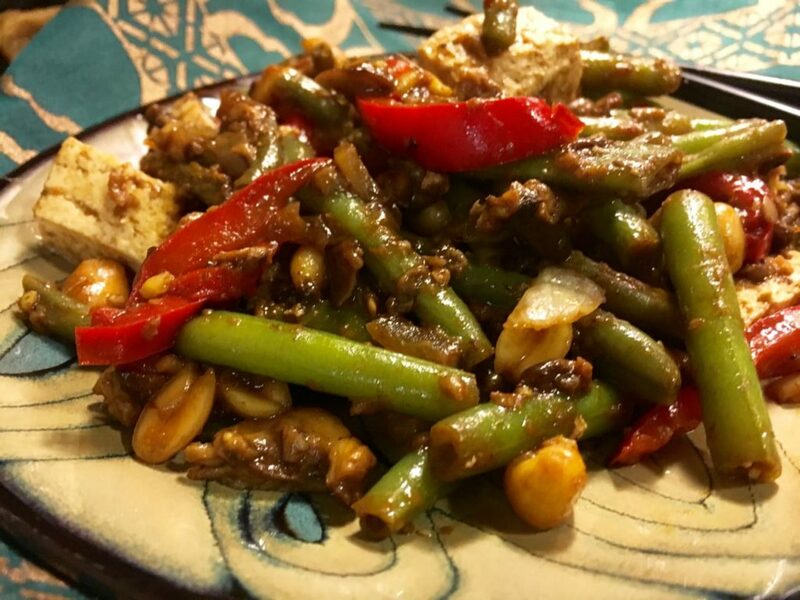 This recipe was one of my favorites, which was designed to take a humdrum vegetable like green beans and liven them up with the savory goodness of fermented black soybeans and shiitake mushrooms. 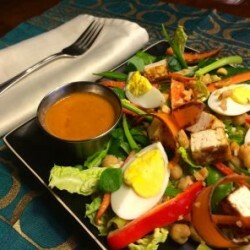 The original dish was terrific on its own, but I built on it to bring in more color, nutrition, and crunch by adding sweet red peppers, onions, and peanuts. 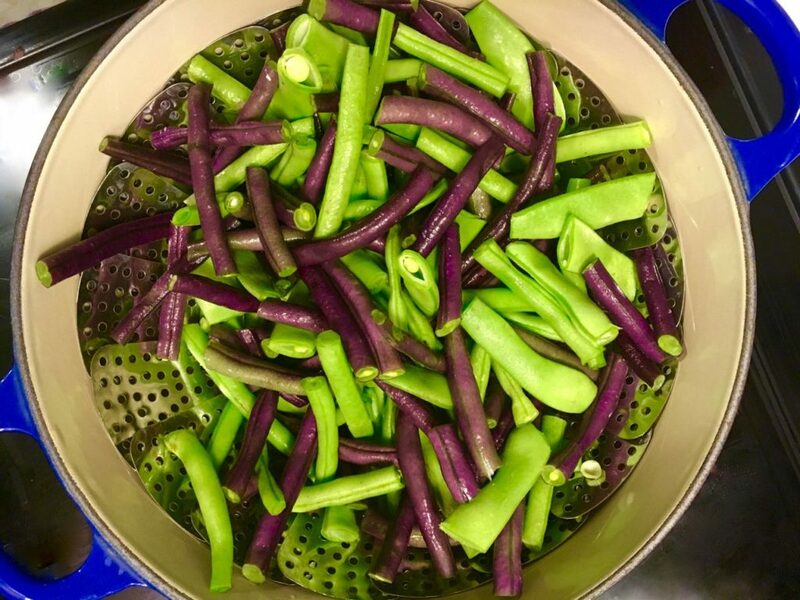 First, I included purple and green beans as well as flat beans, a result of farmers market inspiration. I also upped the garlic and pepper and added grated ginger; hubby and I love big spices and heat. Finally, I added chunks of tofu for additional texture, and to make this dish into a full meal all on its own. What a fantastic weeknight night supper we had! 1. Wash, trim, and cut beans to desired size. If you are using purple beans, enjoy the color now, because it’s lost once cooked. 2. Steam for 3-4 minutes, until crisp tender. Immerse beans in an ice cold water bath to stop cooking and retain color. 3. Heat peanut oil in a frying pan to medium-high and add mushrooms, red pepper, and onions and season with about 1/2 teaspoon of salt. Sauté until cooked but not mushy, about 5 minutes. 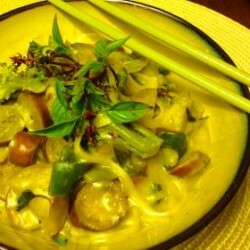 Mix in fermented soybeans and pepper(s). 4. Move veggie mixture to the side of the pan or set aside to a plate. Heat remaining peanut oil on medium-high, and add slabs of tofu. Sear on each side, about 3 minutes each. Remove to cutting board and cut into cubes. 5. Turn heat to high, return tofu to the pan (and veggies, if set aside), and deglaze with sherry. Add peanuts and stir gently to combine and keep tofu intact. Makes 2 good-sized dinner portions—How hungry are you?—with leftovers; serve with brown rice or brown soba noodles if desired. Note. Fermented black beans and shao shing wine can be found in some grocery stores and Asian supermarkets. You can use fermented black bean sauce if necessary. Have fun with this recipe, and make it your own—just as I did. Combine the tofu and teriyaki sauce in a small bowl and marinate at room temperature for at least 1 hour. Go for it! Not necessary though, as the tofu soaks up the flavor during cooking.